Home/Solar Power Kit/Can A Home Owner Afford A Residential Solar Power System? Solar power is the conversion of sunlight into electrical energy, either directly with the help of Photovoltaic (PV) cells or indirectly utilizing concentrated solar power (CSP). Concentrated solar power systems make use of lenses or mirrors and tracking systems to focus a vast area of sunlight into a small powerful beam. Solar panels comprising several Photovoltaic cells convert light into electricity due to the ‘photoelectric effect’. Solar energy is a free and renewable form of energy. 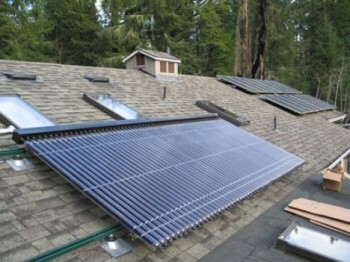 It is worthwhile installing a solar energy system at residences in view of several advantages. Those who have done a cost-benefit analysis of installing a home solar power system might immediately decide to switch over from a traditional energy source to a solar energy system for their homes. However, in order to fully appreciate its utility, advantages and costs, it is advisable to widen their knowledge on solar technology. Solar power is useful for lighting, operating home appliances such as refrigerators, electric stoves for cooking food, water heaters and heating the area inside rooms and running air conditioners and various other equipment. The surplus energy available after meeting all household requirements is stored in special battery bank, which can be used during nights or during cloudy weather conditions. Although it will obviously cost a fairly large amount to install a home solar system, after the initial investment and some maintenance expenses, there will be considerable savings on the monthly electricity bills. Another advantage in having a home PV system at is that electricity companies will purchase any surplus power that is no longer required. Those who have installed solar panels will soon be pleasantly surprised to find that the electricity consumption from traditional power source has drastically come down and consequently, a substantial drop in electricity bills. A solar panel is also very useful for growing plants in a ‘greenhouse’. Greenhouse is built on the roof-top with transparent plastic or glass on which a solar panel directs the heat from the sun warming it up thereby, facilitating the growth of plants. When talking about a home solar power system, a question that normally comes up is how much does it cost? The cost of a complete system varies depending upon its power generation capacity. It is, therefore, important to assess the requirements of electricity for his home, before making a decision to buy the system. It would cost a minimum of $4000, if someone would like to have a home solar energy system installed at his residence by an expert in this field. In contrast, there are numerous websites that provide videos and instruction manuals so that you can build his own PV panels via Do It Yourself (DIY) approach for a budget of less than $200. You will need 8 – 12 panels in order to fulfill the energy requirement of a small house. All materials and tools needed for the job are easily available in every local hardware store. If more number of solar panels is installed, there will be a lot of surplus energy that can be sold to power generating companies. In other words, installing a solar power system will not only help in saving substantial amount of money but also facilitate in generating additional income too. The present state of economy is in a bad shape all over the world. In these difficult times and with ever increasing prices, people are finding very difficult to maintain their current lifestyle. Many people are not in a position to satisfy even minimum requirements of their families. In such a scenario, a home solar power system will help people to afford certain items, which were not within their reach earlier. Moreover, people having an alternative energy system at home will be able to preserve environment and contribute their bit to a pollution- free environment.